Villa Rodos Athena is a contemporary 3 bedroom villa just 5 minutes' walk from Lardos Beach! You'll also have a large private pool, a separate children's pool, set within spacious grounds. There's a beachside tourist shop and snack bar within walking distance and the charming Lardos Village is just a 5 minute drive away. Here, you'll experience a true taste of Greece, with a wide choice of shops, bars and restaurants. Pool heating, WiFi and air conditioning/heating in the bedrooms and lounge are included. A stylish villa with private pool plus Lardos Beach practically on your doorstep - Villa Rodos Athena is a fabulous choice! Outside, the large private pool and children's pool takes centre stage in the spacious lawned grounds. There's a covered terrace that provides respite from the sun as well as a table and chairs, with a brick BBQ to one side for alfresco dining. A pool fence is available on request at an extra cost of £60. There's a gated driveway which is shared with our villas; Rodos Artemis, Rodos Aphrodite and Rodos Estia. The private parking space is to the side of the house with a few steps leading to the front door. The open plan living area is bright and stylish. There's 2 sets of patio doors leading to the pool area, which allow plenty of light to flood the room. There's an L-shape sofa and flat screen TV, along with a dining table and chairs, plus a sleek, well-equipped kitchen. On the ground floor, there's 1 double bedroom with patio doors leading to a small raised terrace, and 1 separate shower room. On the first floor is 1 further double bedroom and 1 twin bedroom, each with patio doors leading to a shared balcony. From here you can take in the splendid views. There's also a separate bathroom on this floor. This villa is registered and licenced by EOT Greek licensing association. This number is: 1476K91000382601. Perfect for beach lovers, Villa Rodos Athena is a great choice - Lardos Beach is just a stone's throw away! What's more, you can reach Lardos Village Square in only a few minutes' by car. There's a great selection of shops, bars and restaurants - you get a true essence of Greece here. Our villas; Rodos Artemis, Rodos Aphrodite and Rodos Estia - all neighbour this villa, making it a good choice for large groups. The village of Lardos has a mini market and a few local shops selling fresh produce. Also, close by, the popular resort of Lindos offers a choice of small boutiques and craft shops. Or there's Pefkos, which also offers a good range of shops. Why not head north to Rhodes Town, where you will find designer shops and well-known high street brands? Lardos is the closest traditional Greek village, and is 5 minutes' drive from Villa Rodos Athena. Life centres around the main square - a wonderful place to sit and watch the world go. It offers a great selection of tavernas with traditional meze's and international cuisine at affordable prices. Alternatively, the resorts of Lindos and Pefkos are also close by with a selection of bars and restaurants. Villa Rodos Athena is located a short walk from Lardos Beach where you'll find a taverna. Just a 15 minute drive will bring you to the family friendly Glystra Beach, a sheltered bay with fine sand and shallow waters. Around 10 minutes' drive will bring you to Pefkos, once a small village now expanding and with a sandy beach. A little further along the coastal road is Lindos Beach with its clear blue sea and spectacular view of the famous Acropolis. Pefkos offers bars and restaurants with play areas for children. Water sports including pedaloes, jet skis and boat hire can be enjoyed in Pefkos and nearby Lindos too. The glass bottom boat can be found at the end of 'boat trip lane' in Pefkos offering short trips around the local bays - perfect for children. Lardos Bay Hotel is next door and often has fun evening entertainment. A short drive away, in Lindos, is the famous Acropolis where you can take a 'donkey taxi' to the top. A little further along the coast is the picturesque St. Pauls Bay and chapel which is popular for weddings. Rhodes Town is just over an hour away by car, where you can enjoy the new and old towns. Or why not visit Mandraki Harbour and see the famous windmills or set sail to nearby Turkey, Symi and Kos? There is only one course on the island - Afandou Golf Course. The trees, fairways, and greens are laid with different grasses selected to keep the course green throughout the year. There is 18-holes and the golf club is open all the year round. Every villa comes with its own manual, complete with details of the best restaurants, taxis, local amenities and activities. And of course, our reps are on hand to make sure you love your holiday more. If you need any advice or tips on the local area, they will be more than happy to help. When you pay for a Villa Plus flight inclusive package holiday our ATOL Licence protects you from losing your money or being stranded abroad. When you pay for a Villa Plus holiday without flights our ABTA bonding provides the financial protection you need. The villa arrival and departure day is . It is available to book on a weekly basis, select the week or weeks you wish to travel. The price per week is the Villa Only accommodation cost for 7 nights (flight prices are not included). How many people will be travelling on the villa holiday? A child must be under 12 years of age on the return journey to qualify for the child price. An infant must be under 2 years of age on the return journey for an infant price. They are not allocated a seat on the aircraft. Would you like to add flights to your holiday or book villa only? Currently we are unable to confirm availability for this villa. Take a look here at the Rhodes villas that are currently on sale. Currently we are unable to confirm availability for this villa. We hope this will change soon. Villa Rodos Athena is not available to book for season as it is sold out. 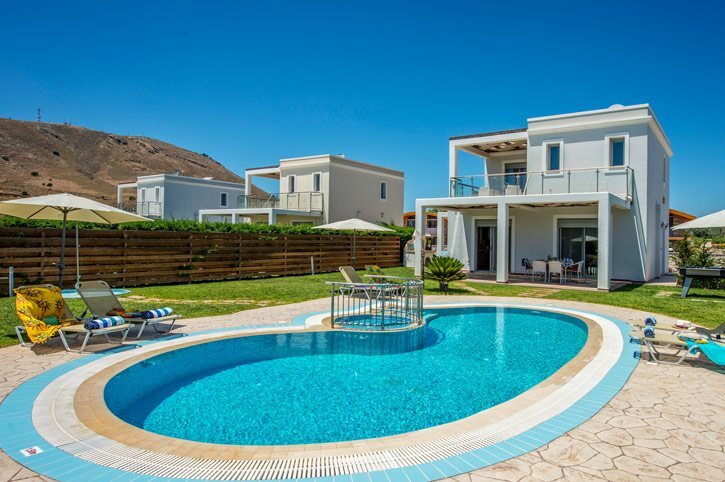 Take a look here at the Rhodes villas that are currently on sale. Please Note: Not all airlines have released their flights for 2020. You can still book your favourite villa today and check for flight availability at a later date. By including flights under the Package and Travel Regulations 2018 your booking becomes a flight inclusive package holiday and you will be covered by our ATOL licence. Water sports are available on all the popular beaches of Rhodes. So whether you want to take a boat out for the day, go snorkeling, water skiing or fishing it’s easily organized. One of the best spots is the Water sports Centre in Kiotari. Water sports at its best, with windsurfing, paragliding, Ringos, Banana rides and Pedaloes. The island of Rhodes is a great place for children of all ages to enjoy. From whizzing round on the Go Karts to watching the tropical fish float by in the Marline Aquarium in the town of Rhodes. There is lots to do for children and even the adults!! The water park is the largest in Europe located on the Kallithea road just outside in the popular resort of Faliraki. With a designated area for KIDS ONLY they can enjoy the wet bubble, tipping bucket, pirates ship, funny bridge, Tarzan pool and waterslides. For the rest of us there are thrill rides, Multi rides or Take it easy rides such as the wave pool and Lazy River, a great day out for everyone! Bay, (22 km from Rhodes Town), on the road from Rhodes Town to Lindos, is home to the only course on Rhodes. Although not a challenging course, it has an atmosphere and feel, it is great for a day out. This 18-hole, par-73, golf course (6800 yards), has been designed by Britains world famous golf course architect, Donald Harradine. Opened in May 1973 the 18 holes the course's tactical features are a challenge to good scoring, both for amateurs and professionals. The trees, fairways, and greens are laid with different grasses selected to keep the course green throughout the year. The Golf Club is open all the year round. Admission fees are nominal (2011 €20 low/mid-season:€35 high season) and caddies, caddy carts, golf clubs and balls, as well as instructions, are available at moderate hire charges. Villa excellent, very good standard plus excellent quality appliances all kept in good condition. Location very good for families, only a five minute walk to the beach. Owner very helpful, no problem too small. Really enjoyable and relaxing holiday. On behalf of the two Sylvias and myself I would like to thank Stergos and his team for making our holiday a delight. They made us feel very welcome and nothing was too much trouble for them. Sue was very friendly and helpful and was determined that our Villa Plus holiday lived up to expectations. Will will definitely come back. Villa was amazing, kept beautifully clean as we're the pool and gardens. We would consider going here again something we rarely do as there are so many places to explore. Third time with villa plus and would definitely recommend them! Note : Whilst some of the original grammar and spelling in these reviews may have been corrected, its nature has not changed.